Whether you prefer a family meal in a local village Taverna, or the sheer opulence of a luxury hotel reception, we have the expertise and experience to meet all of your reception requirements. We can arrange many types of reception, decorate your venue, organise the entertainment or DJ and make sure that you and your guests are where they should be, when they should be. We have from very simply to more extravagant and wonderful choices for your wedding reception celebrations, however we have not present them all. Contact us, let us know what you may have in mind of what your dream reception would be and let us expertly recommend and advise on the most appropriate venues to suit your vision, tastes, and budget. Limited funds or no expense spared, you’ll always receive a five-star reception service from Zaffron weddings. Overlooking the Mediterranean Sea and close to the shores where the goddess of love immerged from the sea waves, you will find an exclusive Venue with beautifully landscaped lush gardens, unique architecture modelled on a traditional village complemented by astonishing dining experiences ranging from a local Taverna to elegant fine dining. This is one of Cyprus’s best kept secret venues that we are happy to share with you. Individuality, innovation and personalised service are the key factors for the success of every event. It is the resorts aim to exceed guest’s expectations, always striving to excel in creative presentation impeccable service and exceptional food. 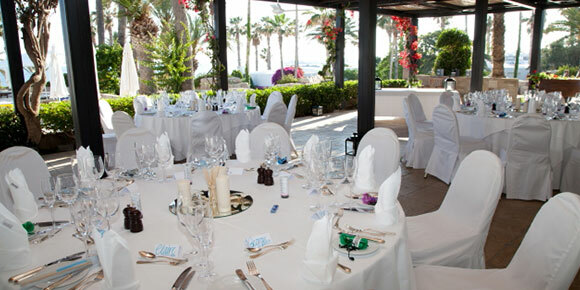 Always giving quality; from the ceremony to the cocktail reception, finishing with your wedding breakfast set on the lawns overlooking the sea. One wedding per day policy at this high end venue. 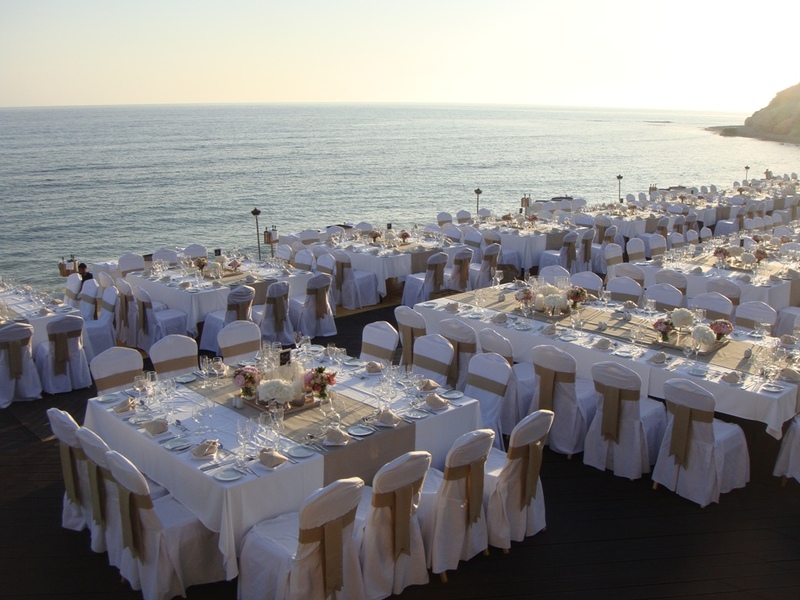 For overseas or local weddings the luxurious and picturesque Resort are truly the Ideal location for both your Cyprus wedding ceremony and your wedding reception celebrations. Situated in the heart of the tourist area; this venue is one of the more popular choices for couples wanting to be close by the sea and amenities. Well known for its excellent service and comfort for guests. This has to be one of the best locations; with its uninterrupted views of the Mediterranean sea and Paphos’ picturesque harbour and medieval castle. 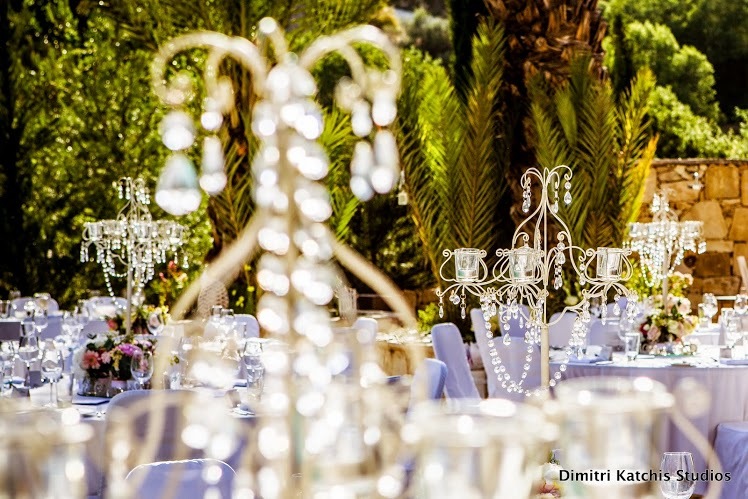 Offering a high standard hotel with a relaxed feel we are more than happy to recommend it for both accommodation and as the venue for your special wedding day in Cyprus. The hotel's tropical gardens are simply stunning along with their sea view and they can offer venues to suit bigger groups to perfectly intimate weddings with small numbers, it is an excellent venue for a wedding ceremony and perfect for a classy wedding receptions. This hotel offers a range of locations for your wedding reception, you can choose from their private indoor restaurant with access to the Deck, the hotels own Taverna located by the beach with its amazing sea view, or their out-door private bougainvillea covered veranda with a view to the sea and gardens. 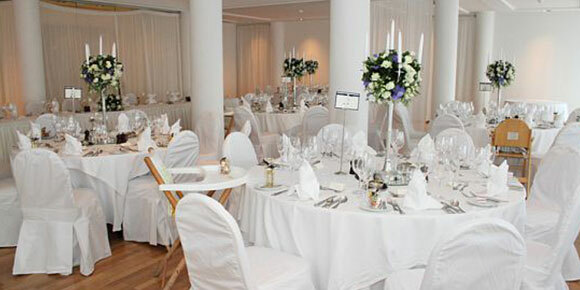 You must be resident at the hotel for two nights if you wish to hold your ceremony or wedding reception at this venue. This hotel is great for those looking for a ceremony and reception venue that is something extra special! This delightful stylish, high-end, contemporary 5-star luxury hotel set in the heart of Paphos tourist area with easy access to the harbour and local shops, bars and amenities, makes this venue is an ideal spot and a perfect choice for those looking for modern elegance and style. 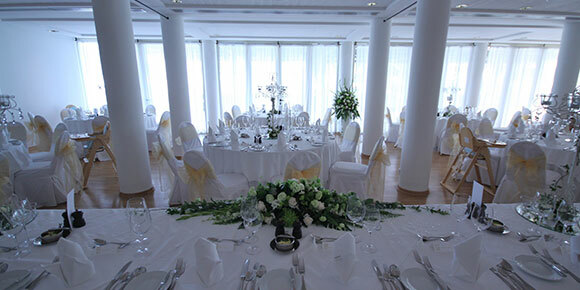 Your wedding reception can take place in a choice of venues all with dazzling sea-views. 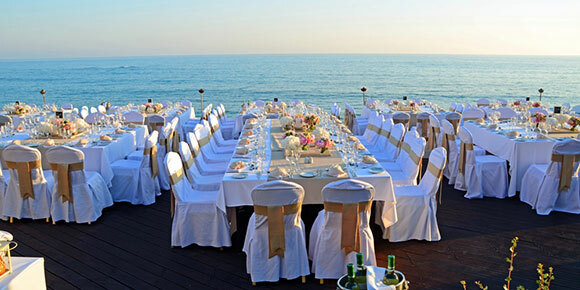 Offering wedding couples a host of locations all overlooking the sea. Choose from the Kyma lawns or rooftops, the West Mosaics Lawn, or the Spa Terrace for your wedding reception occasion. The hotel require that you are resident for a minimum of 2 nights when having your ceremony; plus it is compulsory that your wedding reception meal at this venue too. 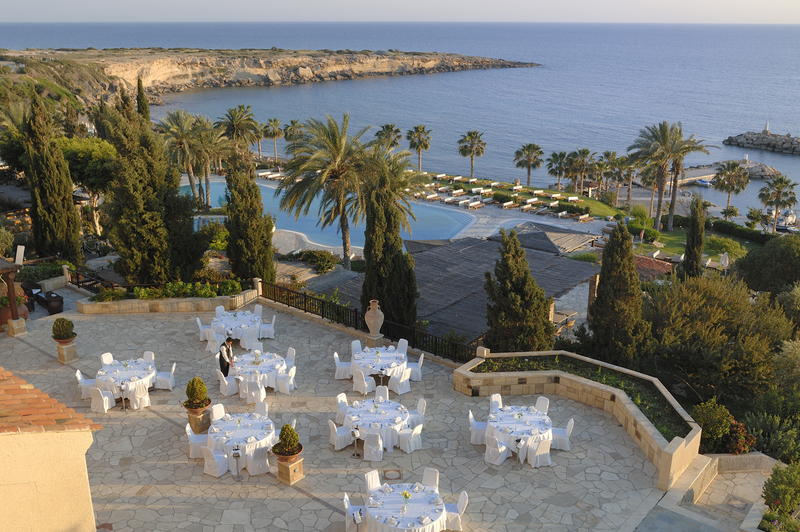 The Cove Beach is, in the most idyllic of settings perfect for an intimate ceremony and wedding receptions overlooking the Mediterranean Sea. 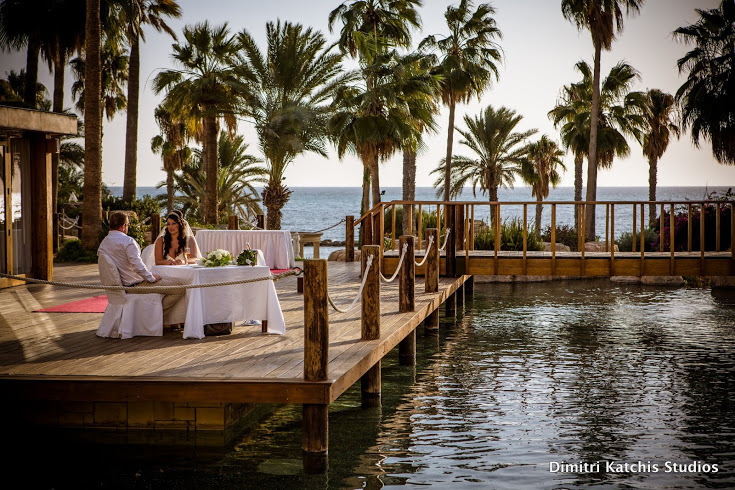 On a beautiful pebbled beach nearby to Aphrodite’s Baths this dazzling venue is probably one of the only private beach locations available in Paphos. A minimum of 35 adults apply for private hire. Tucked in a valley, there are few places that can offer the same tranquillity, panoramic views and sophistication that blends perfectly together to make an inspiring, historic, and truly romantic wedding venue! Equally attractive is the resorts policy of only one wedding per day! Yours! With the advantage of a late finish for those that want to party into the early hours, plus excellent service, menu choices and value for money. Villa weddings are becoming increasingly popular. Staying in a luxury villa for duration of your holiday in Cyprus and choosing to have both your civil wedding followed by reception dinner in the comfort of your own villa. 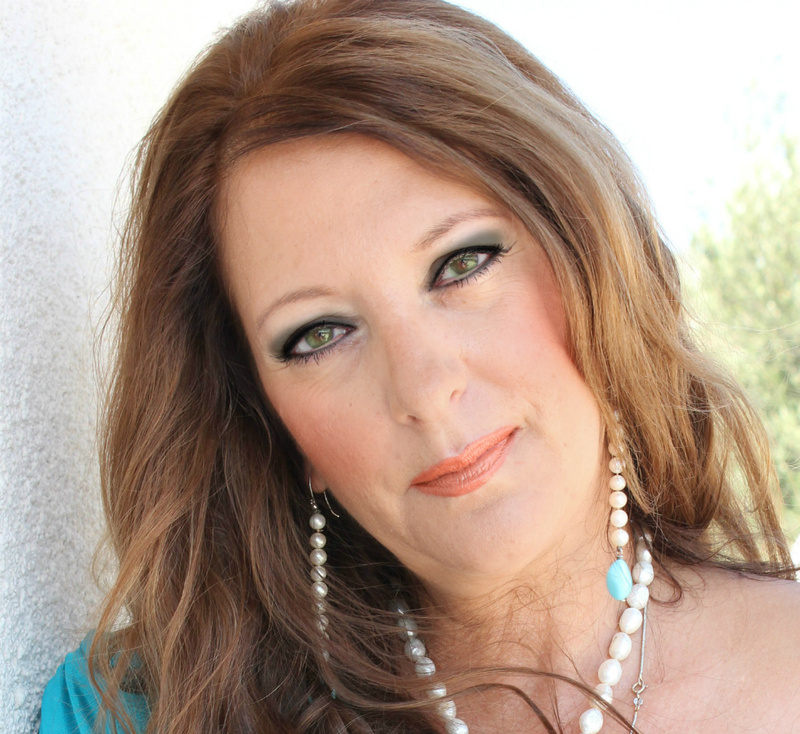 You can choose to have it as low key or lavish as you wish. The beauty of a villa wedding is that you are free to have your own way, no time constraints dictated by out-side venues either. 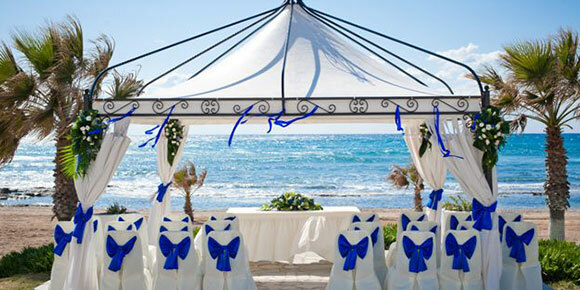 Should you be considering a villa wedding we can offer services to help arrange and create your special day – we can organise waiters and a Chef for BBQ live cooking – all the necessary equipment: Tables, chairs, chair covers, tablecloths, napkins, all crockery, cutlery, glassware and tableware. Delivery, setup and next day clean up. 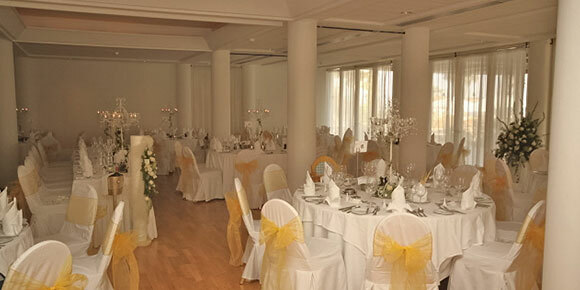 We offer a decorating service for villa weddings. You can even have a dj or entertainer. 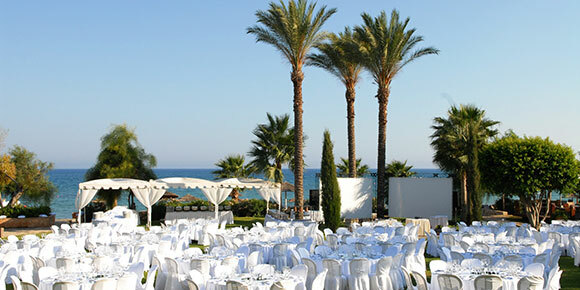 We have lots of villas on our books ideal for you villa wedding or villa wedding reception in Cyprus. Zaffron weddings have a large number of local hotels which are ideal venues for your wedding reception to take place. Many of these hotels have beautiful beachside and garden locations in which your wedding reception can take place. Most provide special locations, pergolas and gazebos for the actual wedding ceremony if you wish to stay at one resort for your whole wedding day celebrations. However; you may choose to marry out-side of a hotel, maybe at one of Paphos’s local churches or town halls and then enjoy a reception at one of our many highly recommended hotel venues. We always only recommend venues that we feel offer the best locations and service to our couples. We can offer extravagant celebration with fireworks or we can organize small dinner by the pool or at the resorts intimate wine cellar. Each couple can choose the type of ceremony that they like most and satisfy their needs and follow on with cocktails and dinner at this excellent mountain resort. Settings are perfect for romantic wedding parties with spectacular indoor or outdoor function spaces combined with breathtaking mountain views. Absolutely stunning. Following your wedding party’s arrival we can arrange for your guests to meet in the hotels stylish bar or poolside bar for a cool drink approximately one hour before ceremony time to ensure everyone is in place and well acquainted! Finally the icing on the cake with choosing this particular venue is that we can offer you a Prestige Suite for one night accommodation FREE OF CHARGE when you provide a reception meal for 30 guests or more, from 10-29 guests a standard room will still be offered free of charge when providing your guests with a wedding reception meal at this hotel!! Getting married is a once in a lifetime experience and even though you may have limited funds, you should strive to obtain the best wedding ceremony available. This most Charming Courtyard Tavern is a Hidden secret right in the Heart of Paphos town. Close to Paphos’s tourist area, popular hotels and stunning beaches; makes this choice very accessible and a short distance to travel. This is an excellent location for your wedding reception. Enjoy your wedding breakfast seated under vines, with the smell of jasmines and the colourful blossoms of the bougainvilleas surrounding you. 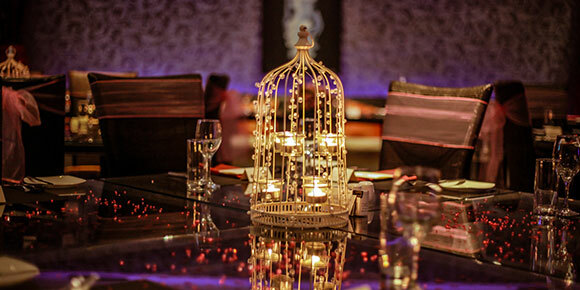 A wide selection of menus and drink packages are available to choose from. After dinner you have the option to dance the night away in the venues inside entertainment suite, where we are happy to arrange Greek Dancers, a DJ or band. Late night finish available here and the option to have this venue privately for just your wedding party in this truly authentic Cypriot taverna. 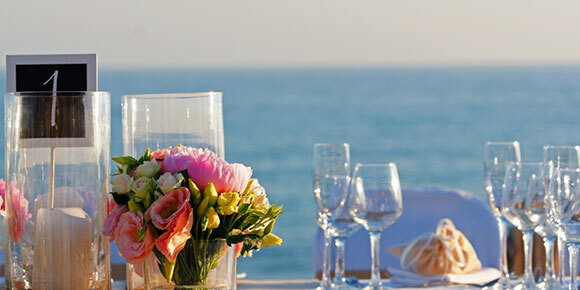 We are happy to arrange wedding receptions in local taverna by the beach. We have a number of restaurants and taverna available with both sea and mountain views that offer tradition Cypriot menus that will delight you. Cypriot family run venues that offer a warm welcome and true Cyprus hospitality with a much more relaxed approach and traditional service; these venue are defiantly for those who want a low key and friendly wedding reception. 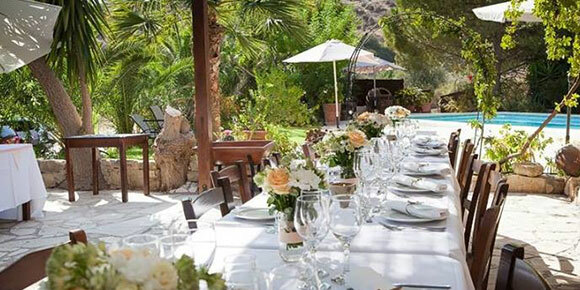 In this venue you are surrounded by local Cypriot charm; with stunning mountain backdrops and vine covered terraces; this venue offers delicious menus with a traditional influence. If you are looking for a real Cyprus traditional setting in a real traditional Cypriot village this is the place for you. 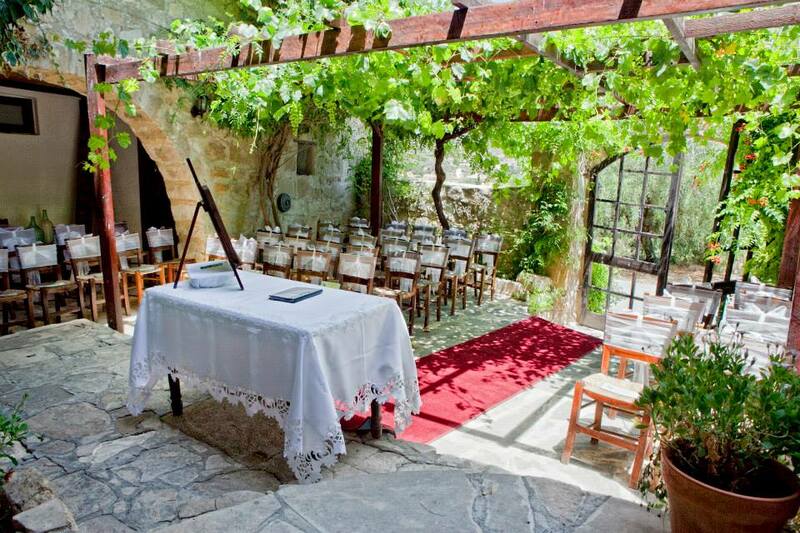 This small boutique hotel/Inn even offers the option of having your civil or religious ceremony in its quaint courtyard. This venue is becoming increasingly popular we advise early booking to save disappointment. For those that want to experience the traditional Cypriot charm and a taste of true Cyprus hospitality . This Hotel-Inn–Taverna venue can offer you a truly magical time – set in the hills not too far out of Paphos. Both quaint and charming to delight your guests. You have the option of staying here in the bridal suite and of having both your wedding ceremony and wedding reception at this venue. Or just come for the wedding reception, the choice is yours. This is a particularly popular choice for many couples and I feel totally different option from the hotel type wedding. One wedding a day policy applies at this venue. Amazing views, gorgeous interiors and spacious grounds, set in breathtaking location at the very edge of the Mediterranean –this new venue is in the heart of a magical wedding day experience. Close to both the sea and the thriving town of Paphos, this unique location gives you the best of both worlds. The peace and tranquillity of the rolling countryside is quite literally, on your doorstep. The superb classically-styled clubhouse forms the centre piece of this fabulous new destination in Paphos. 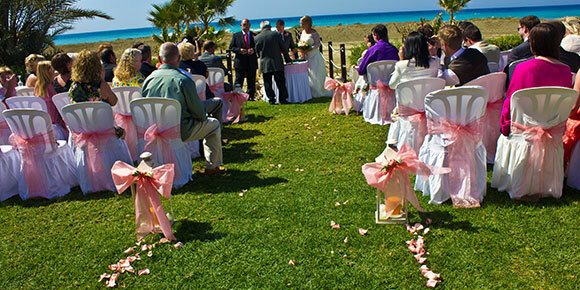 There is the option to have your Cyprus wedding ceremony here followed by your wedding reception, or alternatively just the wedding reception can take place here. You will experience a 'Fairytale' Wedding, whichever package you decide Just dream about arriving to a fully decorated yacht with balloons, ribbons, rosettes, tables decorated with flowers and enjoying a reception of chilled champagne and canapés. Sail out on the crystal clear waters, anchoring in a bay (for those who wish to swim, there are ladders going down from the yachts into the sea), whilst your full buffet dinner selected from our extensive range of Menus is being prepared. Follow on with a selection of fresh seasonal fruits, drinks from our fully stocked bar, speeches, first dance and then dancing the night away. 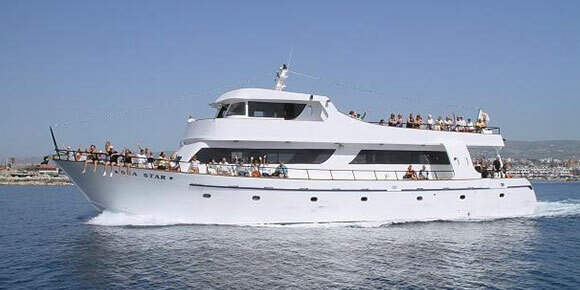 A choice of yachts and menus are available for parties from 10 – 150 wedding guests. 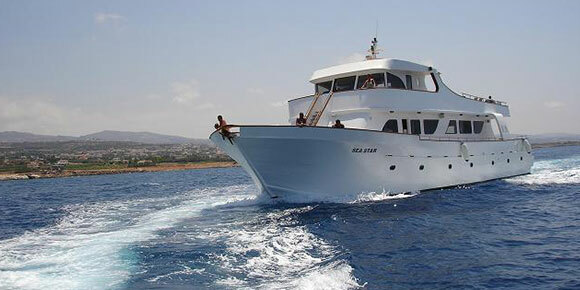 Applicable for Paphos only – you may have your Civil or Church wedding conducted onboard, moored in Paphos harbour, then have your wedding reception cruise to follow. Extra charges apply for church and town hall ceremonies. 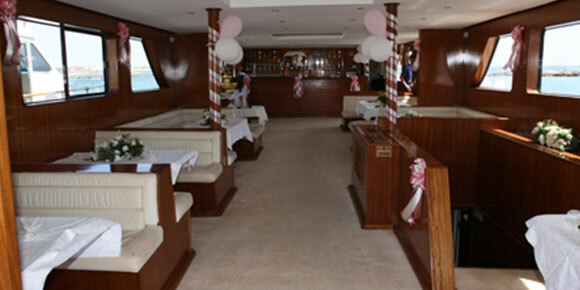 All packages include silk flower arrangement on-board, cotton table linen, silk flower arrangements on pedestals at yacht entrance, red carpet at entrance, wedding march played on couple’s arrival, chilled local champagne reception, gift for the Bride & Groom, Chair covers and organza bows, certificate of wedding on board yacht, cruise voucher valid for 2 years. Children from 3-12yrs are counted as half price. Here at Zaffron weddings we operate on a more personal level, when you are entrusting your wedding day to someone it is reassuring to know that they will have your best interests at heart. Whatever your desire Stella and her team will work tirelessly to ensure your wedding day is everything you’ve ever dreamed of. Situated on Tomb of the Kings coastal road with a lovely sea-view; this contemporary modern restaurant with stylish and comfortable lounge bar and verandas for your wedding guests to relax and enjoy, is the perfect place to celebrate your wedding day. 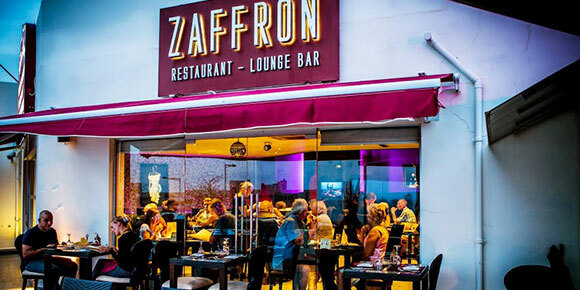 Zaffron restaurant is also available for private hire. 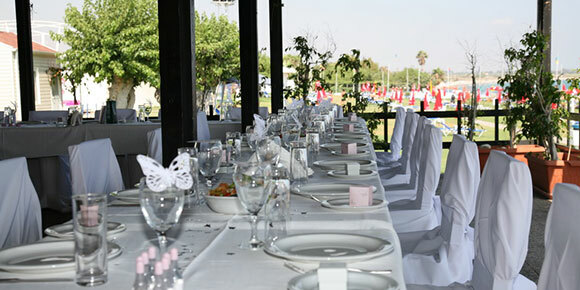 We are licensed until 2 am and the venue would be yours exclusively, with full use of front and back pool-side verandas. 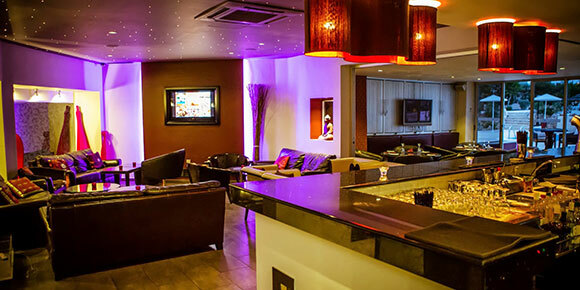 In the case of smaller groups that don’t want private hire, we can offer our lounge bar which is connected to the back dining area. 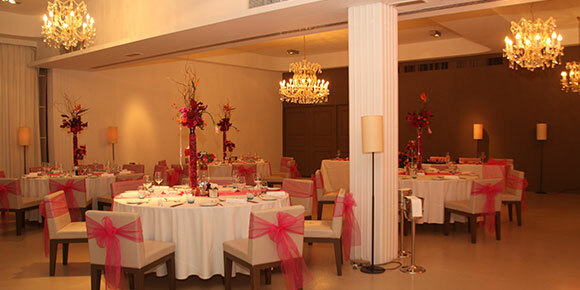 In the case of non-private weddings receptions, we would be open to the public, so that no hire fees apply. Whether you are a big or small wedding party, we are happy to arrange a DJ, wedding singer, Greek dancers or a Band to entertain and delight you and your guests. Whether you want a night on the town, a daytime cruise, a day at a spa for the girls and some pampering or a dawn till dusk party, Zaffron weddings can help arrange your Hen & Stag Do's. With our contacts all over Paphos we can get you some of the best deals and take all the hassle out of planning so that you can just sit back, relax and enjoy it.